How do you celebrate the person who gives so much? 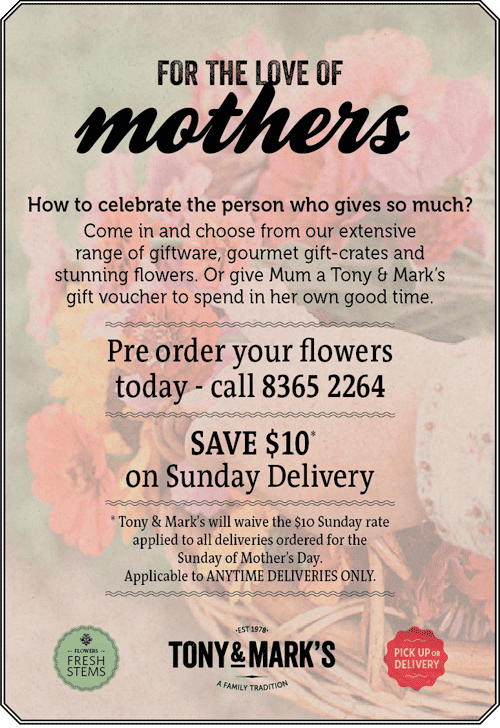 Come into Tony & Mark's and choose from our extensive range of giftware, gourmet hampers and stunning flowers... or give Mum a gift voucher to spend in her own good time. 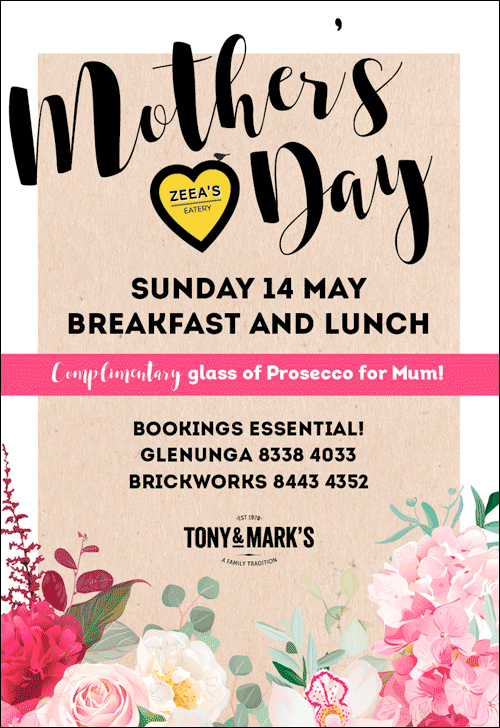 And on Mother's Day, treat her to Breakfast or Lunch at Zeea's Eatery - a great way to get the family together on this very special day. PRE ORDER YOUR FRESH FLOWERS TODAY. 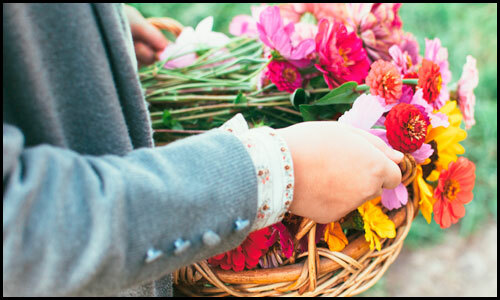 Select your flowers from our Facebook Store (click here) and place your order today to avoid missing out. For pick-up or delivery call 8365 2264 and remember to select the store you wish to place your order from. SAVE $10 ON SUNDAY DELIVERY. Tony & Mark’s will waive the $10 Sunday rate applied to all deliveries ordered for the Sunday of Mother’s Day. Applicable to ANYTIME DELIVERIES ONLY. Help Celebrate Mother's Day with Breakfast or Lunch at Zeea's Eatery. Bring family together to share a meal, an experience and a memory. Call Brickworks on 8443 4352. Call Glenunga on 8338 4033.